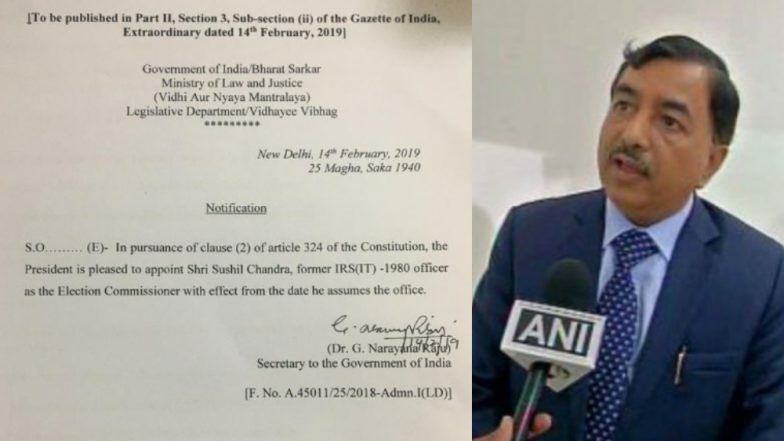 New Delhi, February 14: With just eight weeks remaining for the Lok Sabha polls, the Union government appointed Central Board of Direct Taxes chairperson Sushil Chandra as the new Election Commissioner of India. The 1980 batch officer of the Indian Revenue Services (Income Tax Grade) will join the panel as the second Election Commissioner. Currently, former bureaucrat Sunil Arora is the Chief Election Commissioner and Ashok Lavasa – also a former bureaucrat – is the Election Commissioner. Chandra is an IRS official and an IIT alumnus, was heading the CBDT – the apex policy making body of the Income Tax Department. Earlier, the Union government has appointed Chandra as the CBDT chief on November 1, 2016, and was given a one-year extension till May 31, this year. With the newly added responsibility, Chandra will be on the executive panel taking decisions on the schedule to the upcoming Lok Sabha elections. Lok Sabha Elections 2019: Shiv Sena Demands Maharashtra CM's Post to Continue Alliance With NDA. It is to be known that, the Union government appoint Sunil Arora as the be Chief Election Elections Commissioner of India, who replaced Om Prakash Rawat, prior to the announcement of the results of the Assembly elections in five states – Madhya Pradesh, Chhattisgarh, Rajasthan, Telangana and Mizoram. Congress won the elections in Madhya Pradesh, Chhattisgarh and Rajasthan, while TRS and MNF formed the government in Telangana and Mizoram respectively.